This is the fifth installment of a position-by-position preview of the 2019 NFL draft. Today: Guard-center. 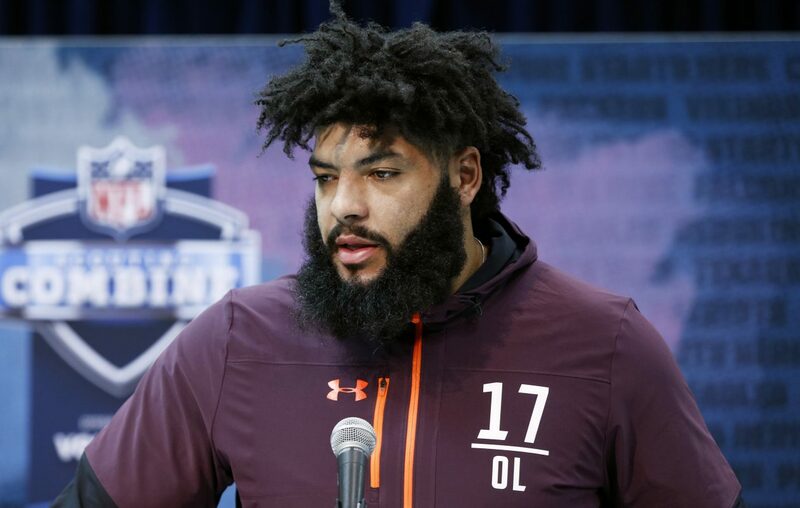 There doesn’t seem to be any guard or center in this year’s NFL draft worthy of a first-round pick, which isn't a problem for the Buffalo Bills given how aggressively they addressed the interior of their offensive line in free agency. However, teams looking to select a player at either position figure to get decent value in the second or third rounds. Of the two spots, guard appears to have a few more players whom talent evaluators around the league see as having their names called on Day Two. Among the top players at both positions are Oklahoma guard Cody Ford, who also could play tackle, and Alabama center Ross Pierschbacher. “There is enough guard depth to project a decent number of early starters and future starters headed all the way into the late fourth and early fifth round,” NFL Media draft analyst Lance Zierlein wrote for NFL.com. Overall draft grade for the position: B-. The Best: Cody Ford, G, Oklahoma. The list of positives is fairly long, even if he isn’t necessarily projected as a first-rounder. At 6-foot-3 and 329 pounds, he has ideal size to play inside, which is where most NFL teams would prefer after proving he could hold his own as a starter at tackle and guard. He impressed scouts with his combination of powerful run-blocking and nimble movement – along with considerable patience and anticipation when it comes to blitzes and stunts – in pass protection. Ford is a probable second-round pick, although having spent his college career in a two-point stance, he’ll need plenty coaching. Bills view: They found their starting center in free agency, Mitch Morse from Kansas City. They also turned to the open market for a pair of guards, Jon Feliciano from Oakland and Quinton Spain from Tennessee, and a center with extensive guard experience, Spencer Long, who previously played for the New York Jets and Washington. Therefore, neither spot can be seen as being anything close to a priority. Still, the Bills enter the draft with more than enough picks to find some quality depth at several positions. Some solid interior linemen should be available in the middle and later rounds. Sleeper: Jon Baker, C, Boston College. For a center, he doesn’t have great size (6-2, 292 pounds). His arms aren’t particularly long and he isn’t especially strong. However, he has a great deal of smarts and his work ethic is off the charts. Limitations notwithstanding, he squeezes every ounce he can out of his skills. “There are guys like Baker playing in the league who get by on their intelligence, instincts and technique,” Gabriel said. 1. Cody Ford*, G, Oklahoma, 6-3, 329. His arms are long enough for him to play tackle, as he did in college, but his height makes him a bigger guard prospect. 2. Ross Pierschbacher, C, Alabama, 6-3, 307. Abundant power makes him a highly effective run-blocker, but sound technique and footwork make him equally solid in pass protection. 3. Michael Jordan*, C, Ohio State, 6-5, 312. Plenty of the right physical traits to excel at center or guard, where he began his collegiate career, but needs more development. 4. Chris Lindstrom, G, Boston College, 6-3, 308. Among the more technically sound players at his position, he maintains good leverage and utilizes his long arms to the fullest. 5. Dru Samia, G, Oklahoma, 6-4, 305. Athleticism complements upper-body strength and allows him to quickly get to the second level and do a nice job of pulling. 6. Nate Herbig*, G, Stanford, 6-3, 335. Not the quickest athlete, but highly physical and shows considerable toughness with an all-out effort to finish every block. 7. Elgton Jenkins, C, Mississippi State, 6-4, 310. Despite not receiving the best coaching in college, he does make up for it with an impressive combination of size, strength and athleticism. 8. Garrett Bradbury, C, North Carolina State, 6-2, 306. A tight end in high school, he shows good athleticism, but needs to get stronger. 9. Michael Deiter, G, Wisconsin, 6-5, 309. Despite being tall for an interior lineman, arm length isn’t great, nor is his agility, but versatile enough to play guard, center or tackle. 10. Nate Davis, G, N.C.-Charlotte, 6-3, 316.Tremendously strong and aggressive player who was a tackle in college, but doesn’t have the height or arm length to do so in the NFL.